One of the newest television shows being aired is one called Common Law. This is a comedy drama series that was created by Cormac and Marianne Wibberley. The show features the story of two Los Angeles police detectives who have difficulty coexisting with one another. As a result they are ordered to see a couples therapist. Common Law is televised on the station known as USA network in the United States. It is also produced by CBS Television Studios. It was initially intended to first be shown in January of 2012 but was postponed until the summer of 2012. On May 11, 2012 the series premiered after the show Fairly Legal. The main premise of the show is about two Los Angeles homicide detectives named Travis Marks and Wes Mitchell. These two detectives do their routine duties of investigating crime and confronting criminals. However they have a very difficult time tolerating and getting along with each other. Since the two detectives are unable to get along, their superior Captain Mike Sutton orders them to see a couples therapist named Dr. Emma Ryan in order to help get the two officers on the same page. Like most other television shows, Common Law has a number of characters that make up the story. The main person in the story is Travis Marks. He is a foster raised individual who was assigned to the LAPD Robbery and Homicide Division. Marks is known to be a womanizer who usually dates a number of women at work. Due to living in a number of foster homes, he has many brothers who still have ties to him. The other main character is Wes Mitchell who is Travis' partner. He was once a lawyer who decided to become a police detective. Mitchell and Marks don't get along and therefore have difficulty working together in many instances. Mike Sutton is the Captain and the superior who orders the two detectives to go to couples therapy. Dr. Emma Ryan is the therapist of both Travis and Wes. She is also friends with Sutton who was once one of her clients as well. There are recurring characters as well such as Alex MacFarland Mitchell who is Wes's ex wife. She is friends with Travis and tells Wes that his former law firm would like him to return. There is also Jonelle who is a forensic pathologist working for the LA County Coroners office. She also once dated Travis as well. The first season comes to a close when Wes and Travis finally reveal what landed them in therapy. Wes regrets confiding in Travis about his dreams about Dr. Ryan. Elsewhere, Dr. Ryan's fiancé may be withholding information about a body found at his construction site. The guys work with their mentors on an important murder case and see their own problems reflected in their advisers. When Wes and Travis suspect a crime novelist of helping a criminal mastermind escape prison, they are forced to "live together" while staking out her apartment. When a fellow officer is shot in a gang related shooting, Wes and Travis investigate the crime while taking on the responsibility of caring for their injured colleague's K-9 dog. Wes and Travis have to role play at their therapy session. The challenge of living in each other's shoes ends up helping them solve a case of a murdered woman. Feeling the weight of reaching a milestone on the job, Wes and Travis become desperate as they hunt for a pair of criminals emulating the famous Bonnie and Clyde. The guys investigate a series of home invasions by a group of thieves and learn that Travis' foster brother could be involved. When the guys are assigned to put a stop to a crime ring stealing high-end vehicles, Travis' ex-partner creates friction. Wes and Travis investigate the murder of a woman whose death could be linked to her involvement in a dating website. During their investigation, Wes discovers that his ex-wife has a profile on the same site and has begun dating again. The team investigates the death of a woman who died on her honeymoon. In the series premiere, odd-couple detectives Wes and Travis are ordered to start couples therapy to salvage their crumbling partnership. While the pair sort out their differences, they also trail a killer responsible for the death of a federal judge's son. 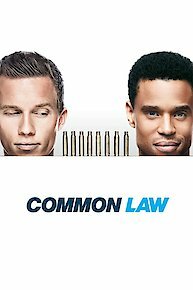 Common Law is currently available to watch and stream on USA. You can also buy, rent Common Law on demand at iTunes online.